Is your Mac machine running a little slowly? Does it hand up more often? MacBook, iMac, it doesn't matter. Over time hard drives accumulate all kinds of things that slow down macOS, especially latest 10.13 High Sierra which requires more available storage and memory. Reasons behind a slow Mac vary, so are the ways to tune it up. Just do a quick search in Apple Support Community, you'll find tons of optimization tips — though many of which turned out to be a little unhelpful. In general, there are two ways to speed up a Mac: upgrade hardware, optimize macOS system. If your Mac machine is struggling to meet the basic requirements for High Sierra or apps, you'll benefit from the addition of RAM or solid state drive (see the best SSDs for MacBook Pro). If the slowdown is software or macOS system related, a Mac optimizer app can really help. Although we'd be realistic that it is unlikely that you'll be able to tune up your Mac with rocket speed. In this review, we'll show you the best Mac optimizer apps to clean, tune-up, and improve your Mac's performance. Depending on the conditions of your computer e.g. new or old, storage space enough to not, your mileage may vary. 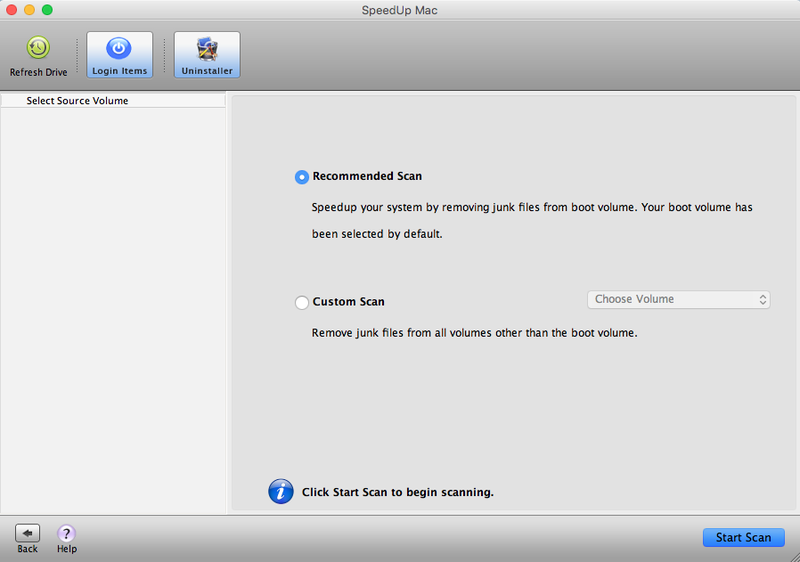 If your Mac is slow because the startup disk is almost full, get CleanMyMac 3 to run a quick scan and remove those system junk and unnecessary files. For most Mac users especially those who aren't tech-savvy, you'll love what IObit MacBooster has to offers. It's a one-stop Mac maintenance tool that can protect and tune up your Mac. 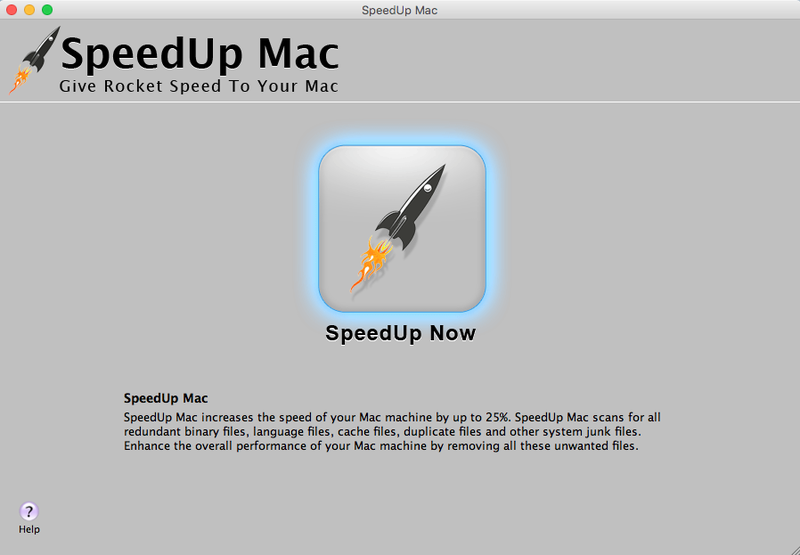 If you just switched to Mac from a PC and prefer apps that are easy to use, consider Stellar SpeedUp Mac as it all starts with one-click to scan and fix all found Mac issues. 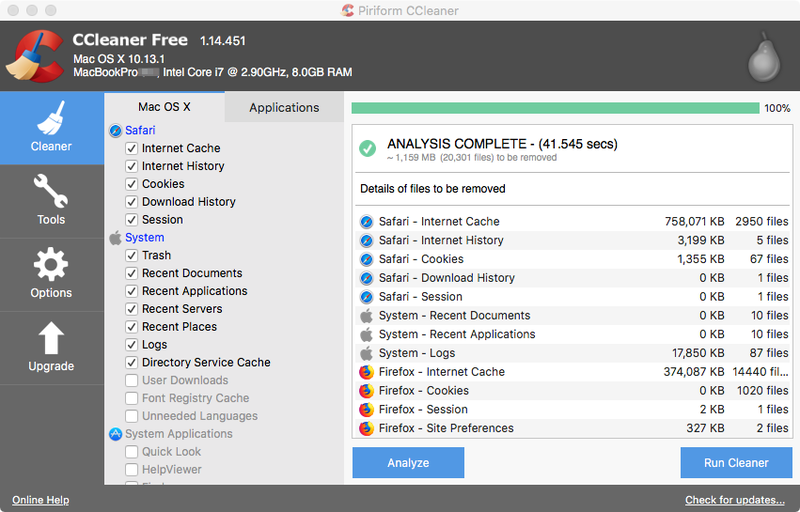 CCleaner Pro is also a great option and it's available for both macOS and Windows. Below, you'll find our detailed reviews, but you can also click the links above to get your desired app and start optimizing your Mac. There is an extensive list of Mac apps that claim to be able to speed up or make a Mac run faster, and usually, each of them has its own unique features. It's really challenging to put them in comparison, so we review each Mac clean/speed app based on the following factors. "...while Apple has earned a strong reputation for security, a string of significant vulnerabilities in macOS and iOS have strained Apple's safety net." Therefore, many people say macOS isn't safe anymore (in our opinion, we'd add "that" before "safe"). We test this by running Mac security software to test whether the app contains malicious procedures. To be honest, we knocked out quite a few programs such as MacKeeper, which was reported by many Mac users for being hard to uninstall. Offensive software like that also hurt user experience. Also, we prefer Mac apps that are light-weighted. That means even if a Mac tuneup app does a great job in helping reclaim tons of storage by clearing system junks, but at the cost of consuming a big portion of system resources while running in the background, we'd rather not to feature it in our best list. This is very straightforward. Apple pushes out a main yet new version of macOS once a year and to date, it's High Sierra 10.13.3. If an app is unable to run smoothly under High Sierra, it's definitely a problem. Because most Mac users will upgrade to the latest macOS sooner or later. According to ComputerWorld, 25% of all Mac users upgraded to 10.11 El Capitan in the first month, not to mention those who chose to upgrade on and from day 31. If the developer of a Mac app fails to update the software in time, chances are the app has compatibility issues with the latest macOS version. Those who download and install it would have a hard time running it smoothly, let alone fixing potential Mac issues and optimizing your Mac's performance. Not all Mac users are tech-savvy. Those who just joined the Apple Mac family or switched from the PCs will take much time getting familiarized with Apple's macOS operating system. When it comes to handling technical tasks such as diagnosing Mac system issues, removing junks, cleaning caches, uninstalling third-party apps, etc., novice users definitely need help along the way so it's ideal that the app developer can offer prompt tech support. All software programs are designed for human beings, not machines. It's important that the best Mac performance tuneup software should be fairly easy and simple to use. From user interfaces, interactive buttons, to explanatory text instructions, they must be clear and to the point. Speaking of this, one main reason why our AnySoftwareTools team love Macs more than PCs is that macOS is much friendlier than Windows. We all are used to the awesome feeling of smooth navigation on our MacBooks, right? If a third-party Mac optimization software can't live up to this principle, we'll hesitate to recommend it unless it shows merits over other aspects. Well, pricing used to be the primary factor when we make decisions and it's reasonable. Who wants to pay for a commercial software given that a free option is available in the market. However, the truth is these days freeware or open source are becoming rare. Plus, many times free apps just don't cut it. What do we mean? Well, we've tested a number of free Mac cleaner and optimizer apps, only to find that some aren't compatible with High Sierra due to lack of update, while others are either confusing to use or very limited in terms of features. We'd rather not to say this, but it's often tedious and frustrating to install a free app and remove it later on. Most newer Mac machines (especially MacBooks) are now with small-volume flash storage starting from 256GB, that means your Mac will fill up quick and run slowly after some time. What can you do? The answer seems oddly simple: clean up Mac drive. But the process isn't as easy as it may sound. Often it takes hours if not days to find out what files taking up the major disk space. That's where CleanMyMac 3 excels. It's an intelligent app designed and developed by MacPaw, aiming to make your life easier. You can use the app to easily reclaim gigabytes of free storage space in just a few clicks. For example, scan and remove system/iTunes/Photo junk, identify large old files that are safe to delete, uninstall useless third-party apps in batch, etc. 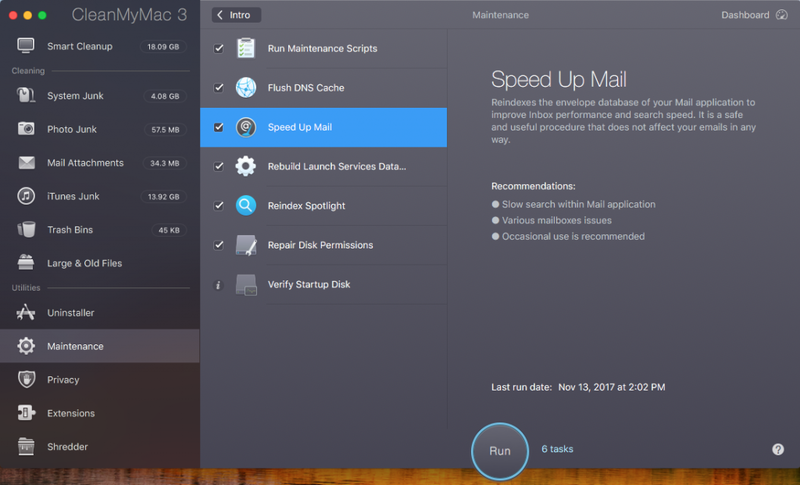 One particular section we like about CleanMyMac is the "Maintenance" module, which is packed with 7 useful utilities that help fix various common Mac issues, such as speed up Mail, verify startup disk, repair disk permissions, flush DNS cache, etc. 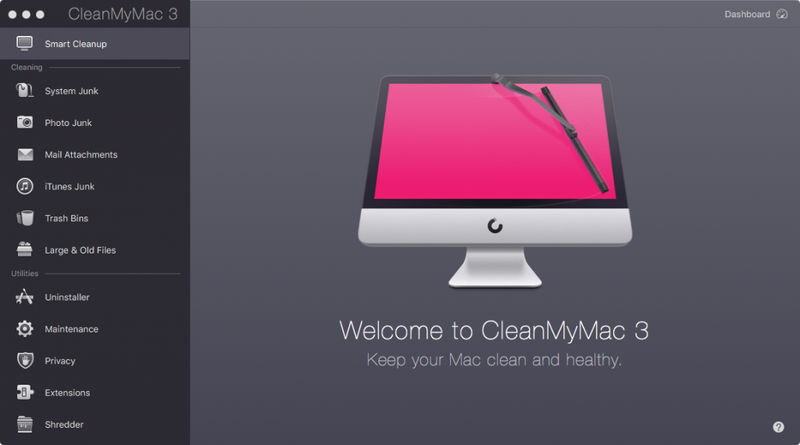 These maintenance tasks are usually for power users, but CleanMyMac makes it easy for us basic users to use as well. There are also a handful of other super helpful utilities within the app, and it's up to you to choose to use them or not. 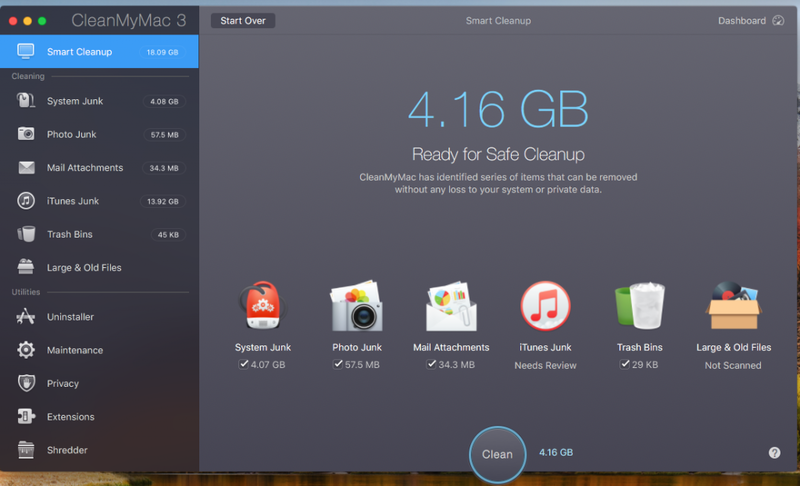 We believe CleanMyMac is the best Mac cleanup app out there and we highly recommend it to most of Mac users. What separates MacBooster from other Mac optimization software is its all-in-one concept. You'll rarely see how one piece of software can achieve so much — protecting your Mac from virus and malware, cleaning Mac disk drive, optimizing Mac startup times, and others. Obviously, IObit wants to position the app as a one-stop maintenance tool for a Mac. Once you install and run the app, the main interface shows "System Status: Unknown". 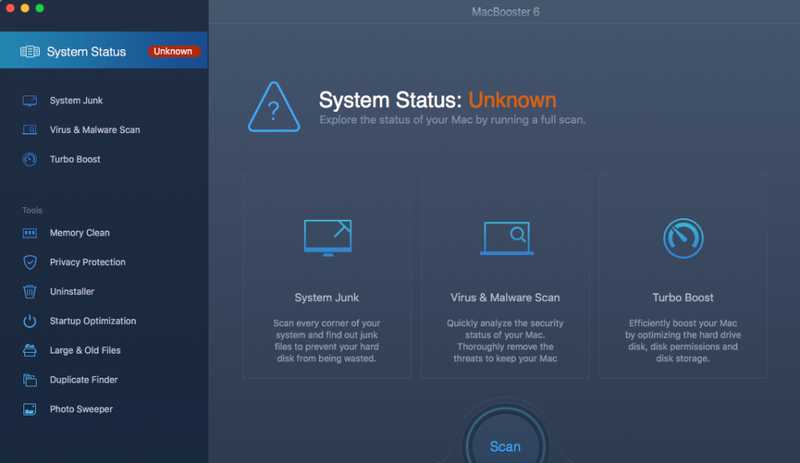 All you need to do is clicking the "Scan" button, within seconds or minutes you'll see an overview report detailing the issues with your Mac system. Well, we have to point out though, that the software over exaggerates the seriousness of certain issues. For example, it detected 5751 issues under Privacy Protection but turned out those "issues" are actually browsing histories we feel okay to keep. Nevertheless, we still think the app is valuable for many users. 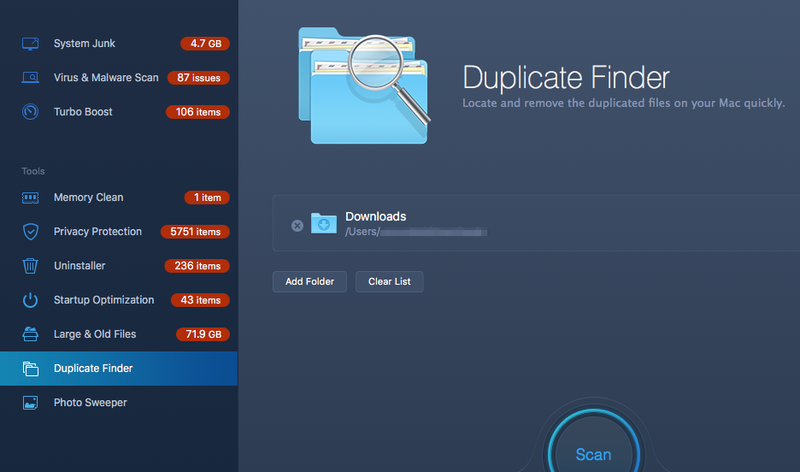 In particular, we like the Duplicate Finder feature — which can help you spot out tons of duplicate and similar items (especially pictures) that are safe for removal. And by doing so, you could free up much storage on your Mac. There are also several other great features like Photo Sweeper, Uninstaller, etc. The bottom line: MacBooster is probably the only yet most comprehensive Mac maintenance app you'll need to keep your Mac secure and fast. Bill itself to be able to "increase the speed of your Mac by up to 25%", Stellar SpeedUp Mac is another Mac performance app that strives to take a share in the crowded market. The app is well designed with clean interfaces and text instructions. To get started, all you have to do is clicking the "SpeedUp Now" located in the center, and select "Recommended Scan" to continue. The app then shows you a list of files that are supposed to be deleted, though within the program this action is called "SpeedUp Now". We found this a bit confusing as cleaning Mac junk files is one thing and speeding up the computer is another, not sure why Stellar Phoenix uses the words interchangeably. That being said, it's one of the easiest-to-use programs we've tested and some of you may actually like it even though it's not the fully-packed or powerful optimization apps. 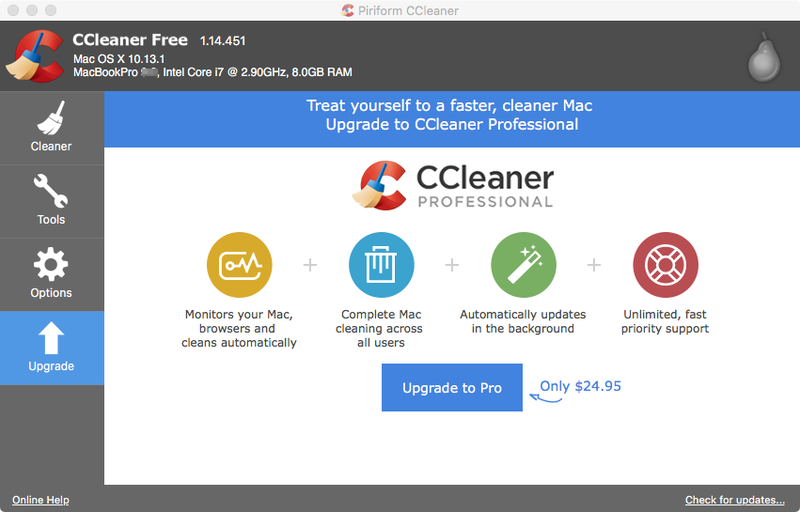 For those of you who just switched to Mac, you probably have used CCleaner back in the PC days. CCleaner was so popular and Piriform claimed it had achieved millions of downloads. But its popularity perhaps has decreased a bit due to the malware hack happened in September 2017 (read more from this Time report). Still, it's a tool loved by many and CCleaner is definitely the number-one tool for cleaning a Windows PC. Thanks for the reviews. I had just downloaded MacKeeper; I wish I had read this first.